Herzog Zwei's spiritual successor now has a complete solo/co-op campaign. After six years in Early Access and a split into three games, Carbon Games's transforming robot action-RTS AirMech now boasts a (mostly) complete solo and co-op campaign, now known as AirMech Wastelands. While technically still considered a beta, it officially left Early Access this week. Inspired by 1989 Mega Drive/Genesis game Herzog Zwei (arguably one of the first ever real-time strategy games), AirMech has you piloting a Macross/Robotech-esque transforming aircraft/robot hybrid and juggling direct combat with foes and constructing autonomous combat units, to assist you in assaulting enemy strongholds. 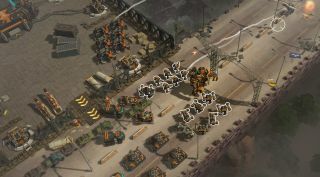 Originally hitting Early Access in 2012, indie developer Carbon Games's ambitions for AirMech necessitated a recent split, with the more balanced and competitive PvP side of the game becoming the free-to-play AirMech Strike, and the more free-wheeling and stat-driven story campaign mode becoming the more traditionally sold AirMech Wastelands. There's even a VR spinoff called AirMech Command, if you've got yourself one of those fancy sets of future-goggles. While some of Wastelands' missions are designed for co-op play, the more solitary among us aren't left out. You can assign a (remarkably capable) AI bot to fly as your wingman, and while their behaviour is a little mechanical, they're very attentive and good at rushing defences to struggling outposts you hadn't even noticed were being attacked. Although Wastelands' story is complete for the time being, development on AirMech continues. Carbon Games have asked their community what their next focus should be for Wastelands—more missions, more mech parts, or a knockabout PvP arena—in this recent development blog post. AirMech Wastelands is out now on Steam for £14.99/$19.99, minus a ten percent launch discount. Those who made any kind of purchase in Airmech Strike before November 1st, 2017 can claim Wastelands for free, as detailed here.